More fun from Campaignville, where even if you don’t live here in Cary, North Carolina — even if you live far, far away — through the magic of social media, you can help spread the word about the Gray Man’s campaign for Town Council! How, you ask? Simple! Print a campaign flyer and put it up in your office, or on your front door, or in the window of your car! (There’s even a place where you can put your name or initials if you like.) Then, wherever you post a flyer, take a picture and send it to me — or post it on Instagram or Facebook or Pinterest or Twitter or wherever, and call your North Carolina friends’ attention to it. Be creative, and have fun! Print-It-Yourself Flyer! Click to enlarge, or download a PDF in either color or black and white. If you live in the Research Triangle area, you could even print more than one if you wanted to, and put a few where people will see them: on the bulletin board at your favorite coffee shop, maybe, or above the urinals at your local bar. Unfortunately, since I’m not raising any campaign funds — I don’t want to get used to spending other people’s money — we will not bankroll the production of these flyers. If you want to spend your own money in your own way, of course, that’s okay with me; I’m not going to stop you. Do NOT affix any flyers to permanent structures without getting the express permission of the owners. Don’t print more than maybe two or three of these and certainly don’t print poster-sized ones and put them anywhere. If you do that, chances are someone is going to notice and complain to the Board of Elections that you’re contributing to the campaign, and the board might ask you how much you’ve spent and you’d have to report it. Nobody wants that kind of headache. This is my version of free market politics, as opposed to the more oligarchical model that we have nowadays. You could think of it as entrepreneurial politics, or maybe “open source” politics or even the politics of the new collaborative economy, rather than the traditional, corporate model of politics. And speaking of collaborative politics, you can help spread the word about this campaign without printing any flyers at all. The very best way you could help spread the word would be to forward this blog post to anyone you know who lives in North Carolina. 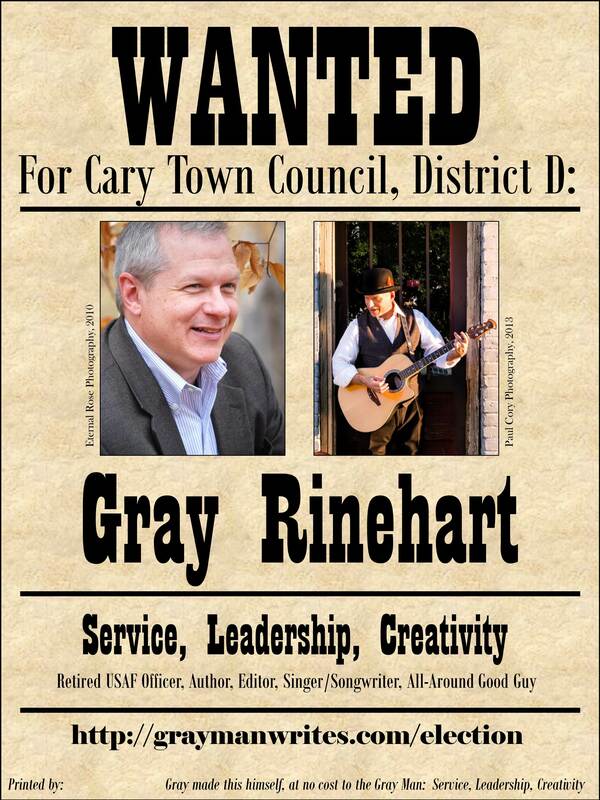 Ask them to forward it to anyone they know who lives in the Research Triangle area or the Town of Cary, and point them to the election page on my website. You can do that by e-mail or by sharing the link on your favorite social media site(s). In the category of “fair warning,” in a couple of weeks I will start walking around some of the neighborhoods in District D. That seems like the best way to connect with real people and find out what they really think about how things are working in the town. At that point I’ll hand out a few of these little flyers, along with some basic information about the foundation of my campaign — Service, Leadership, and Creativity, with emphasis on economic development, emergency management, education, and the environment — to anyone who wants it. If you’re local, and want to make sure I hit your neighborhood or want me to come chat with you and your friends, get in touch! See you out on the campaign trail … or maybe just walking on the greenway! Spending Disclosure: As of this date, my campaign has spent a total of $10. This blog post was “paid” for, at the cost of $0 and whatever time it took to write and upload it, by The Gray Man: Service, Leadership, Creativity. Tagged election. Bookmark the permalink.